The notorious Bridges Juvenile Justice Center (more commonly known as “Spofford”) was a negative presence in the Hunts Point neighborhood for the Bronx for many years, but the gloomy facility is about to do a complete 180. According to Curbed NY, the five-acre site is set to be converted into a sprawling mixed-use project offering over 700 affordable apartments and plenty of community-centered open space including greenery-filled plazas and an art workshop. Since closing in 2011 after years of speculation about the poor treatment of its young detainees, the South Bronx Spofford has sat vacant as a harsh reminder of bad times for the neighborhood. Now, in an attempt to use the site for good, the New York City Economic Development Corporation has decided to convert the former juvie jail into The Peninsula, a mixed use development boasting over 700 affordable housing units and 52,000 square feet of community space. 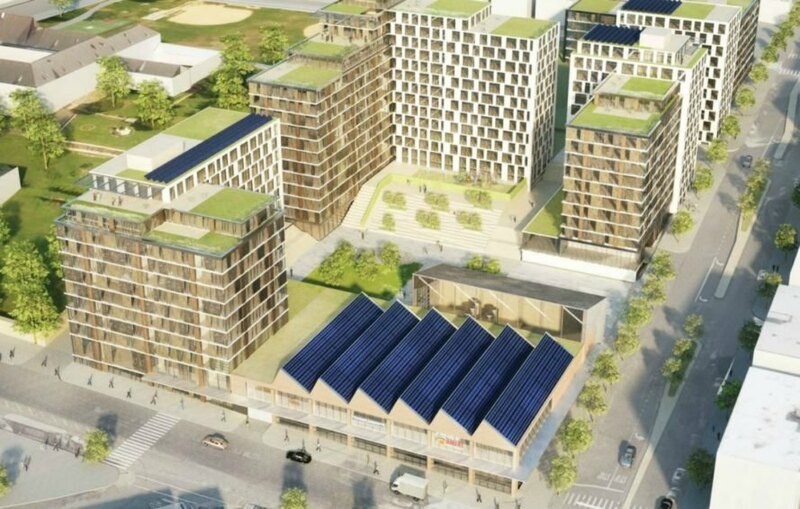 The winning plan for what will become The Peninsula was submitted by a team including The Gilbane Development Company, Mutual Housing Association of New York and Hudson Companies. Hunts Point Councilman Rafael Salamanca hailed the decision to use the formerly desolate site to bring something positive back to the neighborhood. Units in the sprawling five-acre lot will be priced accordingly for local households making between 30 and 90 percent of the Area Median Income. In addition to the affordable housing plan, the $300 million development will focus on providing plenty of community-focused space such as a community plaza, recreational areas and and artists workspace, which may be managed by the local youth development organization, Point Community Development Corporation. The development is tentatively slated to open by 2024. Rendering of the Peninsula by WXY Studio. Street view of the former Spofford Youth Dentention Center.